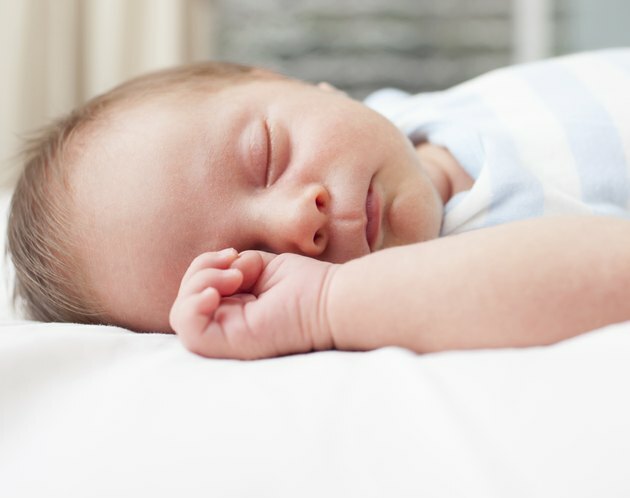 First time parents who expect a newborn to remain wakeful during the day and sleep during the night may be baffled by their child's sleeping patterns. According to the Lucile Packard Children's Hospital, it's normal for your baby to sleep almost all of the time during her first few weeks of life, waking only briefly for feedings. Your newborn baby logs more dozing hours than he ever will for the rest of his life–up to 18 hours during each 24-hour period, says the National Sleep Foundation, with typically only one to three hours spent fully awake. Periods of sleep are almost equally divided between day and night, says the Lucile Packard Children's Hospital. Most newborns sleep between eight and nine hours during the day and eight hours at night. A newborn baby sleeps all of the time because her circadian rhythms have yet to be developed, explains the NSF. Lacking the ability to discern day from night hours, anytime of the day is a good time for your baby to sleep. However, your newborn's period of sleep is actually quite short; she may sleep for only a few minutes before waking or a few hours. Newborns have small stomachs that empty quickly; they wake up every few hours because they need to be fed, says the Lucile Packard Children's Hospital. According to the American Academy of Pediatrics, a newborn has the innate ability to tune out the rest of the world to accommodate his need for sleep, sleeping through doorbells, ringing telephones and other household activities during the day. However, it's important that your newborn be fed regularly. During the first five to six weeks of your baby's life, don't let him sleep for more than five hours at a time without waking him for a feeding, advises the Lucile Packard Children's Hospital. Babies who are born premature can require more frequent feedings than full-term babies and may need to be awakened for meals. If you need to wake your newborn, first try a gentle approach, advises the AAP. Sing or talk to her. Pick her up, stroke her cheek or tickle her feet. A lot of newborns don't like to be undressed; exposing her to a flow of air, coupled with physical stimulation of removing her clothes, is another way to get her to wake up, as is pretending to change her diaper (even if she hasn't soiled the one she's wearing). A more drastic approach to wake a drowsy newborn is to give her a bath. Limit this technique only to times when she needs to wake up for a feeding, cautions the AAP. By the time your baby reaches the age of 2 months, she's likely to sleep for longer periods during the night–between six and eight hours says the Nemours Foundation–and remain awake longer during the day. During the first three years of her life, her sleep will gradually be consolidated into the nighttime hours as her need for daytime naps decrease, states the American Family Physician article. If you're concerned that your newborn is sleeping too much, this may require medical attention, says the AAP. Why Won't My 3-Month-Old Baby Sleep Through the Night?